I put this page together to help my daughter achieve the American Heritage Girls Gymnastics Sports Pin. Artistic gymnastics is a discipline of gymnastics in which athletes perform short routines (30-90 seconds) on different apparatus, with less time for vaulting. The different apparatus for women are vault, floor exercise, uneven bars, and balance beam. For men: vault, floor exercise, pommel horse, still rings, parallel bars, and high bar. This is the style of gymnastics my daughter practices. Rhythmic gymnastics is a sport in which individuals or groups of five or more women manipulate one or two pieces of apparatus: rope, hoop, ball, clubs, ribbon and freehand (no apparatus). 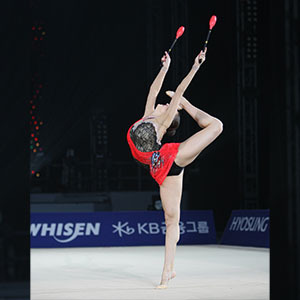 Rhythmic gymnastics is a sport that combines elements of ballet, gymnastics, dance, and apparatus manipulation. Each movement involves a high degree of athletic skill. Physical abilities needed by a rhythmic gymnast include strength, power, flexibility, agility, dexterity, endurance and hand-eye coordination. Rope: (no longer used in competitions) The length of the rope is in proportion to the size of the gymnast. The fundamental requirements of a rope routine include leaps and skipping. Other elements include swings, throws, circles, rotations, and figures of eight. Hoop: A hoop may be made of plastic or wood, provided that it retains its shape during the routine. Fundamental requirements of a hoop routine include rotation around the hand or body and rolling, as well as swings, circles, throws, and passes through and over the hoop. Clubs: The club is a basically a well-crafted regulation-sized stick with a foam piece on the end. The skills involved are apparatus mastery and body elements, Clubs are thrown from alternate hands; each passes underneath the other clubs and is caught in the opposite hand to the one from which it was thrown. Ribbon: It is made of satin or another similar material cloth of any color, it may be multi-colored and have designs on it. The ribbon is 20 feet for seniors and 16.25 feet for juniors. Compulsory elements for the ribbon include flicks, circles, snakes and spirals, and throws. 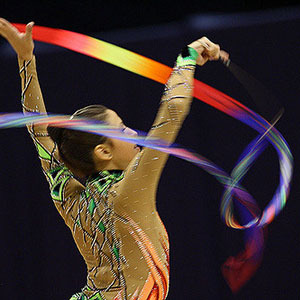 During a ribbon routine, large, smooth and flowing movements are looked for and the ribbon cannot stop moving. Ball: The ball is made of either rubber or rubber-like synthetic material in any color. It is 7-8 inches in diameter and weighs at least 14 oz (almost a pound). Fundamental elements of a ball routine include throwing, bouncing or rolling. The gymnast must use both hands and work on the whole floor area in constant, flowing movements. Tumbling, also known as power tumbling, is an acrobatic sporting discipline which combines skills of artistic gymnastics with those of trampolining. It is sometimes practiced on a 25-meter-long spring track. Competitors perform two passes along the track, each containing eight skills. In competition, only feet and hands are allowed to make contact with the track. Acrobatic gymnastics is a competitive gymnastic discipline where partnerships of gymnasts work together and perform figures consisting of acrobatic moves, dance and tumbling, set to music. Acrobatic gymnasts perform in pairs or groups and enter into and are judged at a specific level or age group category. Partnerships are judged on artistry, the difficulty of skill and the execution of skills. In each partnership, the gymnasts’ different sizes and abilities will be balanced to complement each other in order to carry out the complex moves. Some will mainly carry out supporting and pitching roles and are known as bases. They are then balanced with smaller gymnasts who become the ‘tops’. Exception* – Vaulting: Each vault has a specific point value in the Code of Points and every gymnast performing the same vault will receive the same points. E score: covers execution, composition, and artistry – base score of 10 (which is the max). Deductions are main for any errors with a full point deducted for falling off an apparatus. Otherwise, errors are small (-0.1), medium (-0.3), or large (-0.5). Exception* – Vaulting: Judges start with a base score of 10 points and deduct for form, technique, execution, and landing. This is the most important score in vaulting. *There are several acts that completely invalidate the vault and result in a score of 0. These include receiving spotting (assistance) from a coach and going before the signal. The Code of Points is a rulebook that defines the scoring system for each level of competition in gymnastics. There is no unified, international code of points; every oversight organization designs and employs its own unique Code of Points. The Table of Elements is the section of the Code of Points which is used to identify, classify and assign a value to gymnastics elements, and it is re-evaluated frequently. Every acrobatic and dance skill is listed, illustrated and assigned a specific difficulty rating. Some hazardous skills are banned or given artificially low difficulty ratings to discourage their use. Many of the skills in the Table of Elements are named after gymnasts. An original element is named after an athlete when he or she is the first person to successfully perform it at a World Championships or Olympics. A maximum score of 20 is from adding their composition and execution values. Failure to keep the appliance in constant motion. Failure to end the exercise at the exact moment the accompanying music ends. A low degree of difficulty in the device or in the movements of the gymnast (some degree of difficulty must always exist). Non-rhythmic steps within the tapestry are penalized. Certain non-permissible uses of the hands are penalized. Going beyond the boundary of the designated performance area, whether by the gymnast or the apparatus, is penalized. Communication with the coach or with partners during the execution of the exercise is penalized. The routine is marked out of 10 by five judges with deductions for incomplete moves or poor form. Usually, the highest and lowest scores are discarded. Additional points can be added depending on the difficulty of the skills being performed. The degree of difficulty (DD) is calculated by adding a factor for each half turn (or twist) or quarter somersault. 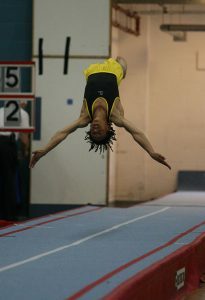 In senior-level competitions, a “Time of Flight” (ToF) score is added to the overall score. ToF is the time spent in the air from the moment the athlete leaves the mat until the time they make contact again and is measured with electronic timing equipment. The total score is a combination of the degree of difficulty (DD) performed plus the total Time of Flight (ToF) minus standardized deductions for poor form and mistakes and the horizontal displacement. a difficulty component which is the overall equivalent score based on the degree of difficulty and number of skills (according to the Code of Points). In the senior age group, routines can carry a difficulty tariff of greater than 10, meaning that scores of over 30 are not uncommon.